At least this wore them out enough to not fight over the bill – an argument other Asian families are likely familiar with. I like congee both ways, depending on the time of day. It’s a completely bland palette upon which you can layer whatever flavor profiles you crave! I grew up mainly eating the sweet variety, with yams or kabocha boiled in with the rice. The deceptively filling combination of hearty grains and naturally sweet kabocha is evoked here in granola bar form. No controversy over these, except maybe a fight for leftovers. Line an 8x8 pan with parchment paper and lightly coat with cooking spray. Preheat oven to 350 degrees. Combine dry ingredients (first three ingredients) and wet ingredients (chia through vanilla) separately, then pour wet into dry and mix thoroughly. The ingredients should clump together easily; wait a minute or two for the oats to soak up the liquids before adding more nut butter or honey for binding. Layer in 1/2 of the oat mixture into the pan, pressing firmly into the corners. Top with the mashed squash and coconut, then add in the remaining oat mixture. Pack it tight! Bake in the oven for 20 minutes. Remove, and refrigerate for 20-30 minutes before cutting into bars or squares. Will keep 1 week in fridge or 1 month in freezer. At first glance, my academic and professional choices align neatly with first generation Asian American parents' preferred routes - I majored in physics, then worked in finance for three years before switching recently to technology. My upbringing certainly has something to do with this, as I was frequently told that quantitative fields were pragmatic choices with high probability of conventional success. But that didn't start in earnest until high school, and only after I started showing some aptitude for math and science. I've always been a bookworm, and early on it was toward English that my mother directed her encouragement and attention. In elementary and middle school she would regularly take my sister and me to the library; we'd return with bags of books that rivaled Matilda's readings in scope and scale. (That's not an exaggeration - sometimes it'd take a couple trips to move them from the car.) I devoured these books and ruined my eyesight by reading everywhere: our dimly lit basement, moving cars, blanket tents. Later on, my mom also read everything I wrote with genuine interest - including, mortifyingly enough, my teenage Xanga ramblings. She said she enjoyed it as good quality work! That assessment must've taken a serious stretch of imagination and motherly love. So while my Asian classmates were skipping levels in math and joining science fairs, I was reading and occasionally writing. It's likely that my mom gave up on the former approach after years of quantitative ineptitude on my part. I was slow to count; I flunked the admission tests for an accelerated math program twice; percentages were completely abstract to me for a while, made no more concrete by the coins and dollar bills my parents used as study aids. At some point, to everyone's great relief, it all did start to click. I can't remember at all what made me gradually begin to understand and even enjoy math. But I do remember the books of my childhood, vividly - even the most juvenile ones. One series I was obsessed with was Nate the Great, which featured a boy detective and his loyal dog Sludge. Both Nate and Sludge are super-sleuths powered by round-the-clock consumption of syrupy pancakes; as I read each story I'd invariably start craving some of my own, and dig out Eggo packages from the depths of our freezer. In solidarity with these fabulous prodigies I'd toast and butter a stack, then quickly dispatch it. Maybe it's the association with Nate and Sludge, but to this day I think Eggo pancakes are tough to beat. There's a gradient of texture that runs from crispy edge to a thick creamy center encased by a perfectly smooth pancake shell. Between the two extremes lies an expanse of airy sweet bites. They're perfectly browned, attributable mostly to artificial coloring rather than caramelization, but satisfying nonetheless. A pancake unsurpassed! - until now. These misugaru hotcakes are taller than your average pancake, and it's this height that allows for the range of consistency that I so loved in my Eggo and Nate the Great days. After flipping, some of the uncooked batter spreads slightly, creating a thinner lopsided fringe that crisps up perfectly. The rest is plush yet airy; since misugaru powder is gluten free, these pancakes run very little risk of becoming tough. 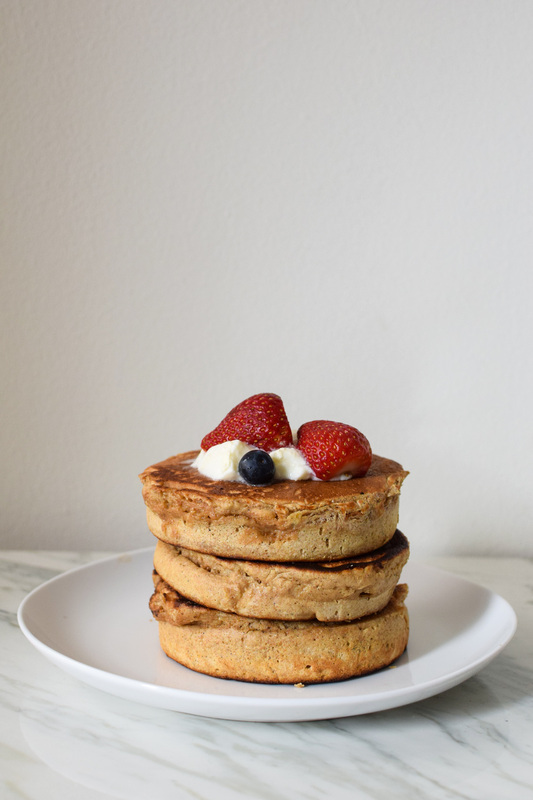 And texture aside, the ten-grain misugaru makes the pancakes delicately nutty and fragrant. The subtlety of flavor pairs well with yogurt and berries, but honey or butter wouldn't go amiss either. Whether you're solving mysteries or math problems, I can't imagine a better brain food than this. Make the batter: Combine the dry ingredients in a large bowl (misugaru powder, flour, baking powder, salt, sugar) and mix thoroughly. Beat the eggs until well combined and frothy, then mix in the milk and vanilla. Form a well in the dry ingredients and pour in the wet ingredients. Mix lightly until all the dry ingredients are moistened but large lumps may (and should) remain - they will help create a fluffy texture. Let stand for a few minutes until the batter is a little bubbly. It should be quite thick. Cook the pancakes/hotcakes: Heat an oiled pan or griddle over medium heat. When a drop of water fizzes across the surface and evaporates immediately, it's hot enough. For regular pancakes, drop ladles of pancake batter onto the hot pan and let spread. For hotcakes, lower the heat to medium low (so the hotcakes don't burn before the center is cooked). Grease a round biscuit cutter or other similar mold (I used the ring from a 4 inch diameter springform pan) and lay it on the pan. Pour hotcake batter in up to 1/2 inch height. The pancakes/hotcakes are ready to flip when bubbles start forming on the top surface and they release / move easily when a spatula is slipped underneath. Flip when ready, and allow the other side to cook through - should take a minute or two less than the first side. Asian desserts are generally much lighter than Western desserts despite how decadent some appear. They’re also lower in sugar, with most coming from natural ingredients. Halo halo is a typical example: it’s a Filipino shaved ice dessert topped with a mix of purple sweet potato, tropical fruit, jellies, red bean, and evaporated milk. Despite the fact that this kaleidoscope of sweets makes Fruity Pebbles look positively bland in comparison, it’s actually quite light and refreshing, even healthy as far as desserts go. Well… so I’ve heard. I’ve never actually tried halo halo despite having eaten at many Filipino restaurants that serve it. Inevitably, I stuff myself on hefty fried meats and aromatic garlic rice; by the time the dessert options are presented, I’m sated with an unforgiving amount of oil and salt and vinegar. I should know by now to plan ahead, but as the saying goes, my eyes are bigger than my stomach. Pacing my meals to save room is something I’ve never been able to do. It might have something to do with the Chinese mentality toward food, developed through a long history of famines and feasts. One: wasting food is incredibly rude – heaven forbid a single grain of rice remains on your plate after a meal. Everything served can and should be eaten, from the aromatics (scallions, garlic, and ginger) down to the gristle and cartilage remaining from bones already picked clean. Two: guests and children will be offered infinite helpings against any protests. No matter how much you eat and how firmly you reject additional food, Chinese hosts will insist you eat more. “Bie ke qi!” they say, or “don’t be polite!”, with ferocity that would border on rudeness were it not so devoted to your personal satisfaction. Thus trained from childhood, I clear my plate and eat beyond satiety, to the point that sometimes the thought of dessert, no matter how light, is utterly alarming. But the solution is simple: begin with dessert! And let’s take it to the next level: dessert for breakfast! This variation on French toast is reminiscent not only of halo halo but also of brick toast, a popular dessert in Japan and Taiwan. To make brick toast, a loaf of sweet white bread is hollowed out, grilled in copious butter and condensed milk, then filled with a generous mix of ice cream, syrups, and fruit. Yeah… that’s still a light dessert, right? (Fruit!) In any case, this recipe draws the best features of both inspirations. It boasts the bright easy flavors of halo halo and the plush custardy texture of brick toast. Syrup is absolutely unnecessary as the slow-roasted purple sweet potato and rainbow of fruit toppings speak for themselves. Mornings like these I could get used to; this time I'll have no problems with seconds, thirds, and beyond. Prepare the sweet potatoes: Prick the skins of the sweet potatoes with a fork, and roast in a 325 degree oven until a fork pierces them quite easily and they are tender. Depending on the size of the potatoes, this will take ~60 minutes or more. I like to start them in a cold oven and keep them in as they preheat so they cook even more gradually. When they are tender, remove them from the oven and keep them in a covered pan (so they steam and tenderize more) until at room temperature. Remove them from skins, and mash the potatoes with a fork; add 1 tbsp milk to loosen and soften as needed. Should make ~1 cup of mashed sweet potato. This can be done the night before. Assemble the stuffed toast: Divide the sweet potato mash into thirds and spread each portion evenly across the whole surface of three slices of bread. Top the slices with another piece of bread. Prepare the custard: Beat eggs, milk, sugar, vanilla, and salt in a flat dish. Make sure everything is completely mixed, otherwise stringy pieces of white egg will solidify and harden on the bread as it cooks. Soak the toast: Dip each side of the two-layered stuffed breads into the custard and let them soak in the dish for 10 minutes, flipping halfway through. If using challah or brioche, which are sturdier breads, soak them longer, about half an hour or even overnight. Cook the French toast: Heat a nonstick skillet with a light amount of half butter and half oil (or all oil) over medium/medium low heat. (I think half butter and half oil allows more control over browning). Cook three to four minutes on each side, or until nicely browned. Discard the oil/butter after each toast. Assemble: Top with red bean paste, banana slices, mango cubes, and coconut. The first time I had a true American continental breakfast was at the Disneyland Hilton. The weekday breakfasts of my childhood were typically a rotating schedule of Cookie Crisps cereal, grocery store pastries, and frozen scallion pancakes reheated in the toaster. (This last one I remember with serious nostalgia.) Today, I’d attack a complimentary breakfast service with enthusiasm bordering on savagery, but at that point I was still a picky eight-year-old who regarded all unfamiliar foods with suspicion. How would I like my eggs? What? I was mildly disgusted by scrambled eggs when they arrived, as their creamy texture appeared semi-raw and nothing like the firm golden strips in our home-cooked stir fries. Sausages were disappointing as well – more peppery than a hot dog, greasier and chewier than lap cheong. I stuck to toast and waffles and all things carbohydrate over the course of that trip, and returned home relieved to have safely navigated the unknown. All picky children ultimately turn into hungry and less discerning adolescents; some even become self-proclaimed foodie adults. Now it’s funny to recall what I once considered too weird to eat, because in our Chinese American household the dinner table didn’t have a distinct nationality. I rejected cheese, ham, sea urchin, and fish eyeballs with equal revulsion. I’m not sure when I grew to like the breakfast ingredients I once avoided but my first breakfast sandwich may have been the driver. It’s the classic case of the whole being greater than the sum of its parts: a toasted bagel providing textural contrast to velvety eggs and soaking up sausage grease, all precariously held together by melted cheese. Honestly, a sausage egg and cheese is just damn good, no need to say more. This version of the classic breakfast sandwich pays homage to the hybrid-culture meals that fueled me growing up. Pillowy steamed mantou hug the ultimate chorizo cheddar scramble; the trick is to just undercook the eggs before filling the buns so they stay fluffy and soft. I topped the mantou with sesame seeds and crispy shallots to evoke the everything bagel, and in the future I’d love to take it to the next level with scallion, poppy seeds, and sea salt. Cheers to now having a palate that allows for these indulgences! Proof the yeast: Combine sugar, yeast, and warm milk and let stand for 10 minutes or until foamy and fragrant. Make the dough: Add the milk/yeast mixture to the flour and mix in the bowl until well combined. Turn out onto a floured surface and knead until the dough is tacky and pulls away from the board, around 10-15 minutes. Lightly oil a bowl and put the dough in the bowl for its rise, coating all sides in the oil. Cover and leave in a draft-free location for an hour or until the dough has doubled. Make the filling: Meanwhile, make the filling. Saute the chorizo slices for a few minutes in a dry pan, and set aside. In a nonstick skillet, heat oil over low heat and add in beaten eggs, stirring frequently and vigorously to break up the curds. Crumble in the cheese and let it melt. Remove from heat when just undercooked (eggs will continue cooking when steamed, and continue to solidify a little as they cool) and stir in the chorizo. Cut parchment squares slightly larger than the palm of your hand for the buns to sit on as they steam. Assemble the buns: Punch down the dough and knead for 5 minutes to press out all the air bubbles. Divide into eight sections. As you work with one piece, keep the remainder covered with a damp towel so they don't dry out. Roll each piece into a flat circle that is thicker in the center than on the edges, and fill with a few spoonfuls of the scramble. Pinch together the edges and smooth out by rolling the dough ball in your hands, then place the fully formed bun seam side down onto each parchment square. Place buns into steamer rack; don't crowd them as they will expand quite a bit while cooking. Steam the buns: They should take about 20 minutes over medium steam. When they are done, gently tip the steamer lid so that steam very gradually escapes; let them sit for 5-10 minutes. This will prevent the mantou from wrinkling.